The design of the bike determines how it wants to corner. And how you place your weight on the bike during a corner affects leanover clearance, traction, and steering feedback. 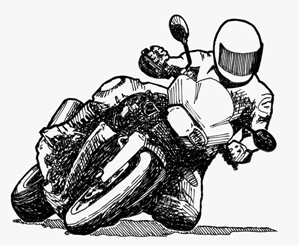 Motorcycle engineers are constantly trying to improve the cornering habits of machines. The geometry of the front end helps stabilize the bike in a straight line. And, a good match of geometry to tire profiles can produce almost neutral steering with the bike leaned over on a level surface. Let's note that the bike is steered and balanced by the front wheel contact ring, both from front end geometry, and from the rider making inputs through the handlebars. If the front wheel is steered less toward the curve, the bike wants to lean over farther. If the front wheel is steered more toward the curve, the bike wants to straighten up. 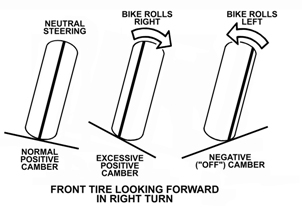 Drag on the front tire contributes to steering, and the location of the tire contact ring determines which way the bike wants to lean. A curve with modestly positive camber allows the tires to be almost perpendicular to the road surface, which maintains the tire contract rings near the centerline of the bike. But a curve with excessive camber, or with negative camber ("off camber") places the contact rings way off center. The bike may feel "funny" on curves with strange cambers, as the push and pull on the tires' contact rings change location. By shifting weight in the saddle, a rider can adjust the lean angle of the bike in relation to the road surface. Shifting weight away from the curve is called "counter leaning." Counter leaning is appropriate for very tight turns at slow speeds, such as a U turn on a narrow road. 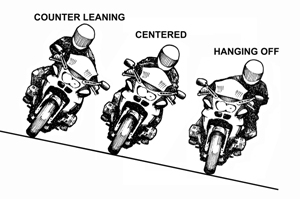 Counter leaning allows the bike to turn tighter because the farther over you lean the bike, the smaller the radius of turn. You're also counter leaning when you push the bike suddenly to a new lean angle, independently of your body. Above: Road camber affects steering, as a result of the contact ring moving off center. Shifting body weight toward the curve is called "hanging off." Hanging off obviously increases leanover clearance. What's less obvious is that hanging off keeps the contact rings closer to the centerline of the bike, which helps neutralize steering. For machines with limited leanover clearance, hanging off can help prevent touchdowns. And even if your bike has more than adequate leanover clearance, hanging off may result in less steering effort needed to keep the bike turning. At Right: Moving your weight in the saddle has a big effect on both cornering clearance and steering feedback. Shift your weight before you lean the bike into the curve. Get your entire upper torso to the "turn" side of the bike centerline two or three seconds before your turn-in point. You may have to hold some pressure on the "up" grip to keep the bike from turning until you're ready. 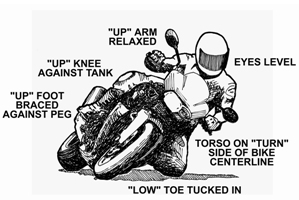 At the turn-in point, simply relax your steering input to allow the bike to lean over. Wedge your "up" knee against the tank to prevent sliding off too far. Brace your "up" leg against the footpeg. Tuck your "down" toe in to prevent snagging it on the ground. You don't want to get your foot caught between the peg and the pavement. Tilt your head to keep your eyes level with the horizon. Level eyes provide a more stable view of the road, and that helps you understand the shape of the curve and predict where the bike is headed. With the bike leaned over, press the grips toward the direction you want to go. In a left turn, pressing both grips toward the left will lean the bike over farther. Or, as Total Control author Lee Parks suggests, steer with one hand. In a right-hander, steer with your right hand. In a left-hander, steer with your left hand. Below: If you decide to add "hanging off" to your set of riding skills, learn to do it right. Whatever the bike you're riding, or however aggressively you are riding it, it's very important to get your eyes up. At a road speed of only 55 mph, you're covering almost 80 feet per second. Even if you notice a hazard and try to take some evasive action, it takes time to make it happen. A reaction time of one second is very quick. Even if you are able to react within one second, you will have covered 80 feet before anything happens. In other words, at 55 mph, that next 80 feet ahead of the bike is history. The message is: there's no point in looking down at the pavement 50 or 60 feet in front of the bike. Looking farther ahead gives you more time to react to what you see. So, get your eyes up, and scrutinize what's happening as far down the road as you can see details. We tend to point the bike where we are looking. And we also tend to point the bike in the direction our face is headed. So, it helps to actually turn your head and point your nose where you want the bike to go. As you lean the bike into a turn, keep your eyes level, and look around the corner as far as you can see. But resist the urge to stare at the painted lines. 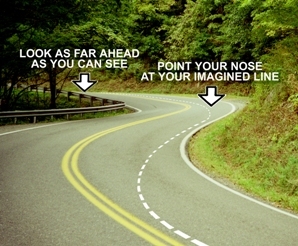 Instead, imagine your line through the turn, and keep your nose pointed where you want the bike to go. At right: There's no point in looking down in front of the bike, because whatever happens within the next second or two is already history. Get your eyes up, scrutinize the road as far ahead as you can see, and point your nose at the line you want the bike to follow. If you want to avoid running into something, you have to be able to either swerve around it, or stop short of it. Either way, you need to be able to control the bike within the road you can see. The shorter your sight distance, the more you are depending upon luck rather than skill. One of the big challenges of very twisty roads with tight bends is that the view ahead is frequently limited. Even if you are very skilled and your reaction times are very quick, it's easy to find yourself going way too fast to be able to respond to a hazard that appears suddenly, halfway around the turn. You may be in good control of the bike, but not in control of the situation. The chances are that sooner or later some situation will exceed your skill and knowledge levels. For that reason, clever riders wear impact and abrasion resistant riding gear. The message is: when you get your turn to crash, you'll be sliding down the pavement in whatever you chose to put on before the ride. If your riding gear is comfortable and functional, you're more likely to wear it "ATGATT". (All The Gear, All The Time).